1. China may have already pulled ahead of the United States to become world's largest economy. 2. India's economy is now the world's third largest economy after passing Japan's. 3. Pakistan is the second least expensive country in the world in terms of how much a US dollar can buy there. 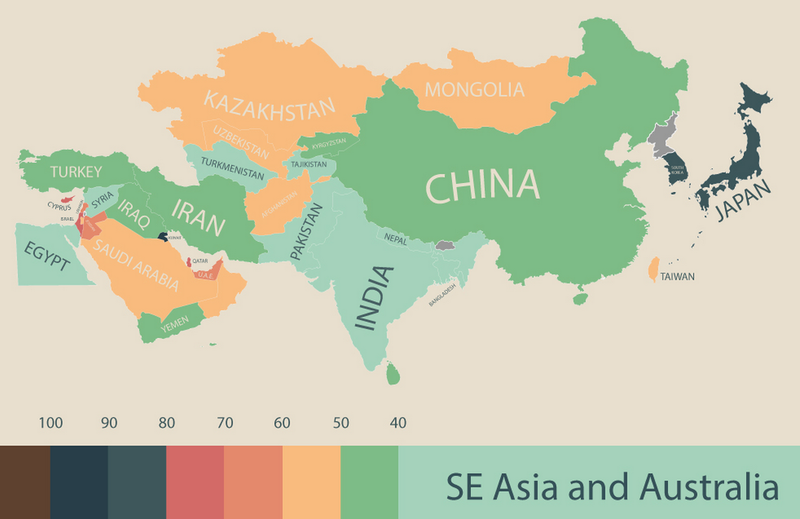 Egypt is the least expensive. 4. The six largest middle income economies – China, India, Russia, Brazil, Indonesia and Mexico – account for 32.3 percent of world GDP, whereas the 6 largest high income economies – United States, Japan, Germany, France, United Kingdom, and Italy – account for 32.9 percent. 4. Asia and the Pacific, including China and India, accounts for 30 percent of world GDP, Eurostat-OECD 54 percent, Latin America 5.5 percent (excluding Mexico, which participates in the OECD and Argentina, which did not participate in the ICP 2011), Africa and Western Asia about 4.5 percent each. 5. China and India make up two-thirds of the Asia and the Pacific economy, excluding Japan and South Korea, which are part of the OECD comparison. 6. Russia accounts for more than 70 percent of the CIS, and Brazil for 56 percent of Latin America. 7. South Africa, Egypt, and Nigeria account for about half of the African economy. At US$4,450 per capita, Pakistan's PPP GDP works out to US$788 billion for 2011, and more than a trillion US dollars now. The results of an earlier ICP program for 2005 and 2006 released by Asian Development Bank in 2009 concluded that Pakistan's per capita income was HK$ 13,528. It reported India’s per capita as HK $12,090. 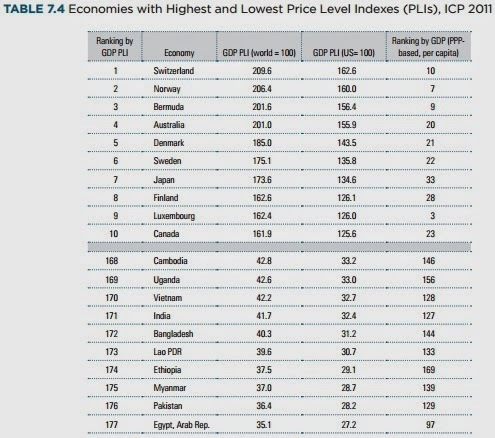 The ICP program uses Price Level Index (PLI) as an indicator of cost of living in a country. It defines PLI as the ratio of a PPP (purchasing power parity) to a corresponding exchange rate. An index over 100 means prices are higher on average than in the world, and one less than 100 means prices are relatively lower. Pakistan's PLI of 28.2 ranks it at 176, just above the last-ranked Egypt's PLI of 27.2 at 177. India's PLI of 32.4 ranks it at 127. 23 economies are showing a PLI of 50 or below. The cheapest economies are Egypt, Pakistan, Myanmar, Ethiopia and Lao People's Democratic Republic, with indices ranging from 35 to 40. The most expensive economies in GDP terms are Switzerland, Norway, Bermuda, Australia and Denmark, with indices ranging from 210 to 185. The United States ranked 25th in the world, lower than most other high-income economies, including France, Germany, Japan, and the United Kingdom. Last month, another survey done by Cato Institute found that Pakistan fares better than its neighbors on world misery index. Back in 1960s, distinguished American economist Arthur Okun defined misery index as sum of inflation and unemployment rates. America's high misery index was cited by candidate Jimmy Carter as a reason to elect him president in his 1976 presidential race against President Gerald R. Ford. The Cato Institute has now revived it by adding interest rates to the sum of inflation and unemployment rates and subtracting per capita GDP growth rate from it. Pakistan (score 21.9) at 28 ranks below Iran (score 61.6) at 2 and India (score 25.6) at 19 on world misery index rankings for 2013 compiled by Washington's Cato Institute. Other nations worse off than Pakistan on the list include Serbia, Argentina, Jamaica, Egypt, Spain, South Africa, Brazil, Greece, Macedonia, Palestine, Turkey, Cyprus, Croatia, Dominican Republic, Georgia, Nicaragua, Honduras, Costa Rica, Jordan, Ukraine, Peru, Uruguay, Portugal and Barbados. Indonesia (score 21.6) at 29 is only slightly better off than Pakistan. Earlier this year, Economist Intelligence Unit's latest Worldwide Cost of Living survey revealed that Pakistan’s Karachi is the second cheapest city of the world in 2014 while India’s Mumbai is the cheapest. The top 10 cheapest cities include Mumbai, Karachi, New Delhi, Kathmandu, Damascus, Algiers, Bucharest, Panama City, Jeddah and Riyadh in that order, according to EIU. Sir this data is according to PPP index not nominal GDP index? Aero: "Sir this data is according to PPP index not nominal GDP index?" It's from World Banks International Comparison Program based on actual prices of 800 items in 199 countries including Pakistan. As an Indian this is all BS. Nominal GDP is what matters.PPP is for soothe sayers! In nominal we are #10 we need to be #3 by 2025. I have read somewhere (in a reputed journal) that Pakistan,s economy is the World's 15 or 16th largest economy; too much of Pakistan's real economy is "black" I-e unreported. Anon: "Nominal GDP is what matters.PPP is for soothe sayers!" ICP program provides a good comparison of standards of living in different countries for everything produced and consumed within each country. However, it doesn't apply well to imports which have to be paid for in real US dollars, not PPP dollars. Rounding up the top 10 Muslim nations are Nigeria ($511 billion), United Arab Emirates (($503 billion), Algeria ($475 billion) and Bangladesh (419 billion). Top 10 Muslim economies have combined population of 1.1 billion people and their combined GDP is $10.2 trillion, just behind the United States's $15.5 trillion and China's $13.5 trillion GDP. Really good news for South Asia all round. Our common culture, in 1707, had 24% of world GDP, and by 1947 this stood at about 1.7%. The WB updated the 2012 data on the website and i am guessing that the old british emipre, xBurma, now (2014) has $8 trn (India), $1.1 trillion (Pak), $600 bln (Bang). Say in total $9.5 trillion or 9.5% of world GDP. We are still 10% behind 1707, but still good going for us all given the conditions we found ourselfs in 1947. With growth in the region around 4% to 5% we should collectively regain lost ground by the 2040's.As in Indian i am particulary happy that the indian economy is growing at a steady pace, despite some of the obvious falws, and will be a job growth generator in the next few decades to come. 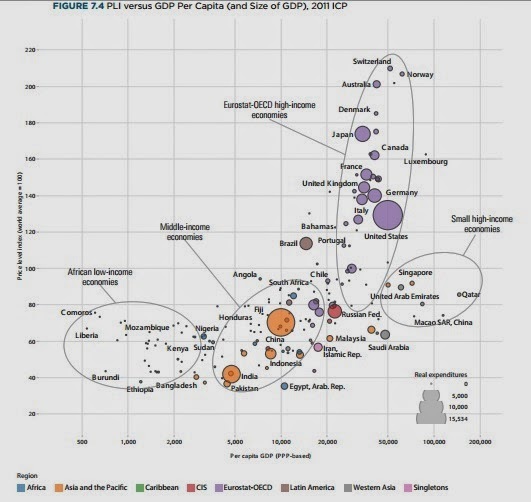 Farhan: "Actually World Bank already has updated the List by GDP PPP upto 2012"
This uses the standard method, not based on ICP 2011. It puts Pakistan's GDP for 2012 at $795 billion and ranks Pakistan's GDP at #24 in the world. Now that Modi is in power due to a clear majority, the hope is that the mandate of accelerating growth can be achieved. No worries about appeasing smaller coalition parties. The next few years will tell. Mahesh: "Now that Modi is in power due to a clear majority, the hope is that the mandate of accelerating growth can be achieved. " Manmohan Singh will go down in history as the man who surpassed Japan to make India world's third largest economy in terms of PPP. I think future historians will treat Manmohan Singh kindly. Firstly as many Indians have pointed out PPP is a feel good statistic.Nobody in India is very excited about PPP we passed Germany in PPP way back in 1998 and it has taken this MMS govt 10+ years to pass a country with a pop 10% India's is no achievement. What really matters is nominal GDP and the core industrial sector which this MMS Italian waitress party has run to the ground! But with a strong mandate it is very likely to change in the next 2-3 years. What was heartening about this election was"
This means that for the first time most Indians voted for the promise of efficient government and economic growth. If Modi delivers and he has a good record of implementing projects then this will be a turning point in Indian politics where parties will begin to compete primarily on ability to deliver economic goods and not votebank politics though of course caste and religious identities won't disappear overnight! The Annual Plan Coordination Committee has recommended setting next year’s economic growth target at 5.1% and of inflation at 8% but cautioned that energy shortages, security situation and additional taxes may pose downside risks to the growth target. The APCC also recommended setting the investment target at 15.7% of Gross Domestic Product (GDP) against this year’s 14%. The per capita Gross National Product (GNP) is projected at Rs160,443 for the fiscal year 2014-15, commencing from July. Headed by Minister for Planning, Development and Reforms Ahsan Iqbal, the APCC on Monday cleared the economic framework for the approval of the National Economic Council (NEC). Prime Minister Nawaz Sharif will chair the NEC on May 29 to approve the framework. “The growth targets are subject to risks like deterioration in energy availability, extreme weather fluctuations, non-implementation of envisaged reforms and fiscal profligacy,” noted the APCC. The APCC working paper, prepared by the Planning Commission, carries some quality advice for the Ministry of Finance to bring real improvement in the economic conditions. It notes that the outlook for 2014-15 portends a significant recovery in growth momentum and trajectory amid wide ranging challenges including persistent energy shortages, supply-side constraints, inefficiencies of production, further reduction in fiscal deficit by mobilizing additional revenues and demand for structural reforms besides security challenges. “Without bringing improvement in tax collection, investment and increasing exports, the country’s national development agenda remains incomplete,” said Iqbal after the APCC meeting. The 5.1% growth rate is projected to be achieved with the aid of healthy growth in industry and services sector but a risk remains that growth in the agriculture sector will remain weak in the next fiscal year as well. The agriculture sector is projected to grow by 3.3%, industry 6.8% and services 5.2%. The large scale manufacturing is projected to grow to 7% next year. Regaining macroeconomic stability and adequate investment are critical for improved growth prospects, the APCC working paper observed. The constraining factors such as lack of structural reforms, high fiscal deficit and accommodative monetary policies are no more desirable as they have serious consequences for inflation, balance of payments and foreign exchange reserves, the paper noted. The government has also pinned down the reasons for below the expectations growth in the outgoing fiscal year. The growth rate of 4.4% for the outgoing fiscal year was consistent with assumption of slight improvements in energy supplies, normal weather conditions, fiscal adjustments and better investment prospects. Some of these targets could not be achieved, resulting in the subsequent missing of the annual growth target. “Fiscal situation for 2013-14 faced certain downside risks like shortfall in FBR tax collection and a sharp rise in federal current expenditures on account of more than budgeted expenditures on power subsidies and persistent increase in interest payments”. It noted that in the outgoing fiscal year, the financing of the modest current account deficit remained challenging and the trade imbalance remained a cause of concern for a sustainable balance of payments. For the upcoming fiscal, exports are projected to grow by 5.8% to $27 billion from $25.5 billion of this year. Imports during the next year are projected to grow by 6.2% to $44.2 billion, up from $41.6 billion of this year. The trade deficit is projected at $17.2 billion. The current account deficit is projected at $2.8 billion or 1.1% of the GDP as against deficit of $2.6 billion or 1% of the GDP of this fiscal. The net capital inflows for the next fiscal year are estimated at $5.6 billion as against $4.9 billion of this year. Like all data, though, there are reasons to treat PPP-based calculations with caution. For one, they are a statistical construction, based on complex surveys of baskets of goods in many countries. The IMF points out here the possible statistical errors. And the ICP notes in Wednesday’s release there’s a margin of error either way of 15% when using its data to compare economies of different sizes. Some economists believe nominal GDP, by using market exchange rates, better measures what a nation’s people or its companies can buy in international markets. Then, there’s the big issue of the relative populations of an economy. In many ways, it’s no surprise China, with 1.3 billion people, is catching up with the U.S., whose population is about a quarter the size. Indeed. Ranking the ICP numbers on a per capita basis, China comes in 99th position. India is at No. 127. The U.S. places 12th, a reflection of its much higher productivity and relative wealth. According to a World Bank report, 13.1% or one in eight people living in urban areas live below the national poverty line. Pakistan has the lowest percentage of urban poverty among the top five most populous countries in South Asia, but the according to the World Bank statistics, the poverty level is till high compared to other Asian countries. Difficulty in dealing with the pressures that increased urban populations put on infrastructure, basic services, land, housing and the environment have fostered what the report calls “messy and hidden” urbanization. This, in turn, has helped to constrain the region’s full realization of the prosperity and livability benefits of urbanization. “If managed well, urbanization can lead to sustainable growth by increasing productivity, allowing innovation and new ideas to emerge,” said World Bank Managing Director and Chief Operating Officer Sri Mulyani Indrawati. “Better cities can help reduce poverty, improve living conditions and create the environment for more and better paying jobs,” she added in releasing the report titled Leveraging Urbanization in South Asia: Managing Spatial Transformation for Prosperity and Livability. Annette Dixon, Vice President for the South Asia Region of the World Bank, said policymakers in the region face a choice: Continue with the same policies or undertake reforms to tap into the unrealized potential of South Asia’s cities, where the urban population increased by 130 million from 2000 to 2011 and is poised to grow by almost 250 million in the next 15 years.